As a Staff Member, you will live in a cabin with 10 campers and another staff member. This will be your co-counselor. The campers and co-counselor make up your cabin. This your family at camp. You will share the responsibilities of cabin and camp life. You will eat meals together, sleep in the same cabin as your campers and participate together in evening programs and cabin closing. A significant part of your job is to work with your co-counselor and develop guidelines so that everyone in your cabin has a consistent framework for dealing with conflicts. 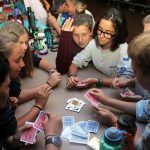 You are expected to be active participants with your cabin and must communicate effectively with your co-counselor so that both of you are comfortable with the cabin dynamic. Program is designed to facilitate play in a safe atmosphere so that as many children as possible want to participate. Together, you and your co-counselor, have the chance to change their lives forever! 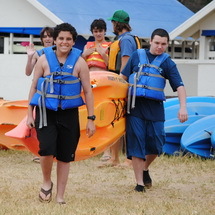 Cabin Counselors are responsible for their cabin group as they travel around camp to their daily activities. Cabin groups are all one grade or a mix of two consecutive grades. As a cabin counselor you remain with your group the entire day and participate in activities with your campers. Whilst at activities, you are assisting the Activity Specialist with the program. In a typical day you will need to be a coach, an older sibling, a parent and a friend. This is a general position. You do not need experience in any of the program areas, though it helps. You will participate and supervise campers for 20 hours a day. Comfortable traveling by boat as you will make bi-monthly trips to the mainland to pick up new campers. Activity specialists spend the majority of their day teaching in a particular program area. Each activity period lasts 1 hour 20 minutes and there are four activity periods per day. 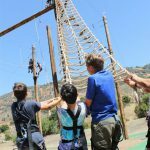 Camp activities are geared to the level of the participant and though campers can choose not to participate we do have minimum participation requirements for some activities (i.e. putting on a harness even if the camper is not going to climb). Specialists are also responsible for their cabin, outside of program areas. Activity training is to help staff members become familiar with our program. Some program areas require that you have previous experience teaching, leading or significant personal accomplishment in the program area. All program areas require a willingness to learn the activity they are applying to teach. Skin Divers, Sailors, Boat Drivers & Naturalists, because of the nature of their job, should have current or previous Lifeguard certification or be very comfortable in the water, upon arrival at camp. A Waterfront Lifeguard course is held the first few days of staff training for these positions, to ensure that staff are able to lifeguard in a Waterfront environment, rather than just a pool. Depending on space, other program specialist may also take this course. 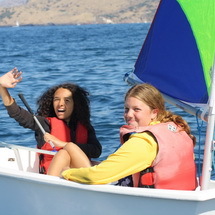 Take participants out in Hobie Cats and Expos and teach them the basic sailing skills. 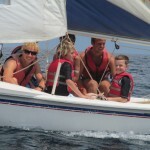 Campers will have the opportunity to learn to sail in a smaller setting during our Badgework week. Sailing instructors will also have lifeguarding shifts throughout the day. Previous significant teaching and sailing experience preferred. 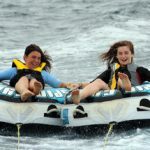 Drive participants in Power Boats, on Towable Tubes, water-skis and wakeboards. This includes Early Morning (6am) and normal program times. Instruct and teach necessary skills to perform and demonstrate competence in the program area during our Badgework week. Daily runs into town for Drop Offs and Pick Ups, gas and mail. Perform routine upkeep on the boats. Boat Drivers will also have lifeguarding shifts throughout the day. Other duties include assisting in the camp store during store time and select evening programs. This position does require specific certifications. Please contact the office for more information. Boat Driver in Training (BDIT): Due to the specialized requirements of a USCG Catalina Limited License for our boat drivers, CIC has developed a summer-long paid training program. The goal of the program is to provide operator training and meet USCG sea service and employment requirements. 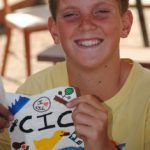 A BDIT must be 18 years old, graduated high school, completed at least 1 session as a CIC Counselor in Training and have small boat experience outside of their time at Catalina Island Camps. 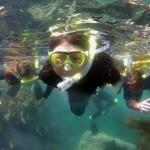 Instructors teach Snorkeling, Kayaking, Stand-up Paddle Boarding & Marine Ecology. Take participants on adventures in and out of the cove. Explain and identify marine animals and plants. All skin diving instructors will teach each program area & have lifeguarding shifts throughout the day. Specific training for these activities is provided during staff orientation. Experience skin-diving or scuba diving. Experience Ocean kayaking. Previous teaching experience preferred. 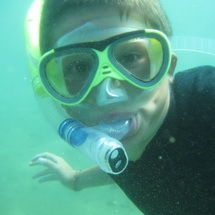 Skin diving: Teach campers basic snorkeling, including, putting on and taking off gear (wetsuit, mask, fins), how to enter and exit the water and diving. Kayaking & Stand-up Paddle Boarding Teach campers basic paddling techniques, including how to properly wear a lifejacket, maneuver in small spaces, capsize and entering and exiting the water. Marine Ecology: Play a variety of games which illustrate very basic marine science principles. 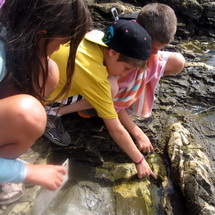 Use identification sheets to explain to campers the different sea-life they will encounter. 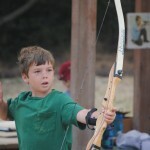 Instructors rotate through and teach the basic skills of Archery, Riflery and Tomahawk throwing. 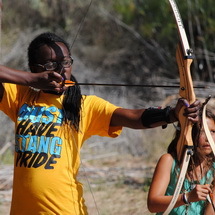 These skills include safety instructions, parts of the bow, arrow and gun and how to shoot and throw properly. Instructors lead participants through a variety of different levels of each activity. Experience with target sports is preferred not required. A willingness to learn and comfortable with bows and arrows, air rifles and tomahawks a must. 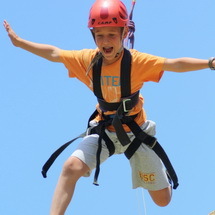 Low-Ropes & Group Games: Lead a variety of team-building games & facilitate group initiatives with and without equipment. Process group experiences so that cabin groups learn the process of communicating and team-building. 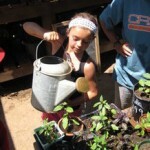 Instructors teach a variety of activities including gardening, composting, nature hikes and tide pooling. All Naturalists will teach each program area. Specific training for these activities is provided during staff orientation. Experience with gardening, composting, tide pooling, or environmental education and teaching experience preferred. This position does require a Waterfront Lifeguard Certification. Instructor works with a variety of artistic mediums. Focus is on a relaxed and traditional crafts. Projects include: lanyards, friendship bracelets, clay sculpting, but not limited to these things. Every second week during badge more specific crafts are created. 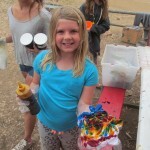 Experience working with children and art projects. Able to create activities for various age groups simultaneously. Must be able to work in program area independently. 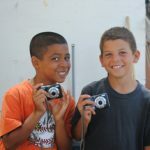 Both positions capture campers and staff participating in camp, edits photos/videos and uploads them to our Camp photo sharing server. 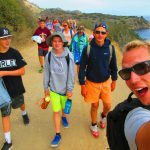 Photographs and Videos are property of Catalina Island Camps and are also used for marketing. They are also used for our slideshows for campers. Becoming a Waterfront Lifeguard is highly encouraged, as it allows for more opportunity to capture great moments. Teaching experience, experience with digital photography, PCs and Video preferred. Please have portfolios available. Instructor is responsible for managing the camp store. Items include camp apparel and treats. Duties also include mail runs and delivery, prepping for evening programs that have soda and candy and assisting in program areas where needed and available. Experience working with young people in one-on-one and group situations. Must be able to work alone. 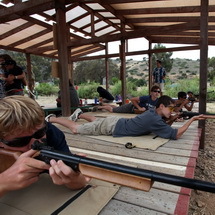 Instructor is responsible for implementing camper-choice activities. This is constructed around the idea of camper free play. This will involve planning fast paced games ( GAGA, Archery Tag and Quiddage) & low energy activities ( legos, book reading, resting ). This is a split activity period. Experience working with young people, able to assess and modify the situation based on camper interest & environment is key. Must be able to work alone. Plan and lead day trips and overnight adventures throughout the island. This includes packing for, cleaning and cooking on out of camp adventures. This position also involves an Outdoor Cooking aspect (using coals, wood and Dutch Ovens). This job requires versatile staff members who are capable of instructing a variety of program areas. Specific job responsibilities might change daily as different needs arise. Outdoor Leaders will not live in a cabin with children. Be prepared to sleep multiple nights on the ground and outside. This is a Leadership Team position and requires staff to be a minimum of 21 years old, have a clean driving record and a Waterfront Lifeguard Certification. Previous experience leading hiking adventures highly recommended. Must be a quick learner who is extremely flexible and comfortable working in a variety of settings with a variety of people and able to think on the fly. Previous resident camp experience preferred. These positions are very intense and generally reserved for previous CIC staff.